The First-Aiders: Helping Yourself & Others Workshop & 12th Anniversary celebration! Voice Vision in association with the Life supporters Institute of health sciences (LIHS), a recognized International training center of the American Heart Association, organized a one of its kind workshop on first-aid and self safety specially designed for the visually impaired on Sunday, April 15, 2012 at H. K. Institute of Management studies, Jogeshwari. This kind of a workshop has been conducted for the first time in India for the benefit of the visually impaired. “The First-Aiders: Helping Yourself and Others” workshop was staged in the backdrop of Voice Vision’s 12th anniversary. The event was flagged off with a warm welcome by the anchors, Mr. Arun Iyer & Ms. Urvi Jangam followed by the traditional singing of the Sarasvati vandana by Dr. Divya Bijur. This was followed by a presentation made by one of Voice Vision’s ex-student Ms Nidhi Goyal, where she highlighted the organizations activities and achievements of the past year. The presentation was followed by the declaration of the Voice Vision scholarship 2012 – 2013. Ms. Sushmeetha B. Bubna founder Director of Voice Vision, Ms. Upasana Saraf a trained clinical psychologist and Ms. Meenakshi Kilpady the principal of Dr. Radhakrishna High school constituted the judging panel and were called upon to announce the winner of the scholarship. The scholarship award of Rs. 5000/-, Scholarship certificate and a computer training course at Voice Vision, was awarded by Mr. and Mrs. Bubna to Mr. Amar Pawar for his exemplary academic and non-academic performance. This small presentation by the hosts was followed by breakfast, after which it was time to begin with the first-aid training. The training was a day-long workshop with an equal mixture of theoretical explanations and practical demonstrations. The workshop commenced at 10:45 AM and went on till 7:00 PM. It gave the visually impaired people an overview of what should or should not be done in various situations such as epilepsy, fainting, dehydration, breathing problems, bleeding, choking, fractures, burns, snake bites, cardiac attacks, etc alongside hands-on experience of preventing bleeding, applying bandage, splinting, Cardio Pulmonary Resuscitation (CPR) and allied. The participants comprising of diverse age groups from different locations including Mumbai, Nagpur, Pune, Gujarat, etc belonging to various organizations like MNB home for the blind, NAB India, NAB (DOR), BGFI, AccessIndia, Voice Vision students and list members were thrilled to be a part of such a fulfilling & enriching experience. In order to make this training more effective, the trainers and volunteers were subjected to a small sensitization workshop conducted by the members of Voice Vision, a week prior to this event, which helped the trainers and volunteers to get familiarized with the basic ways and techniques to address a visually impaired. The Life supporters’ team of trainers and volunteers made special modifications to accommodate practical demonstration where ever necessary for optimum understanding of the techniques by the visually impaired. They also focused on giving individual attention to every participant, thereby making their experience of learning, more value-driven. To learn more about LIHS visit their website, http://lifesupporters.in/about_us.html  . We extend our heart felt gratitude to LIHS for conducting this very useful training and appreciate the time and the initiative taken by the doctors in understanding the minute points while addressing an audience consisting of visually impaired individuals. We also thank the judges for our Voice Vision Scholarship, Ms. Meenakshi Kilpady & Ms. Upasana Saraf, for taking out time from their busy schedule and helping in selecting the most eligible candidate. We also thank the authorities & staff of H.K institute of management studies for lending us their premise for hosting the event and for all their help & cooperation. We thank the caterers for the scrumptious lunch & refreshments. Big thanks to all the volunteers who dedicatedly worked right from the registration desk, to escorting the participants, to serving food and to the winding up of the session. It would have been difficult to manage without their assistance. We also thank the employees of Ascent Networks pvt ltd. For all their help & support in the preparation of the event, and a big thanks to the Voice Vision core committee, who have worked very hard behind the scenes. Last but not least, a big thank you to all the participants and guests who attended the session and helped make it a huge success. We look forward to your support in future as well. 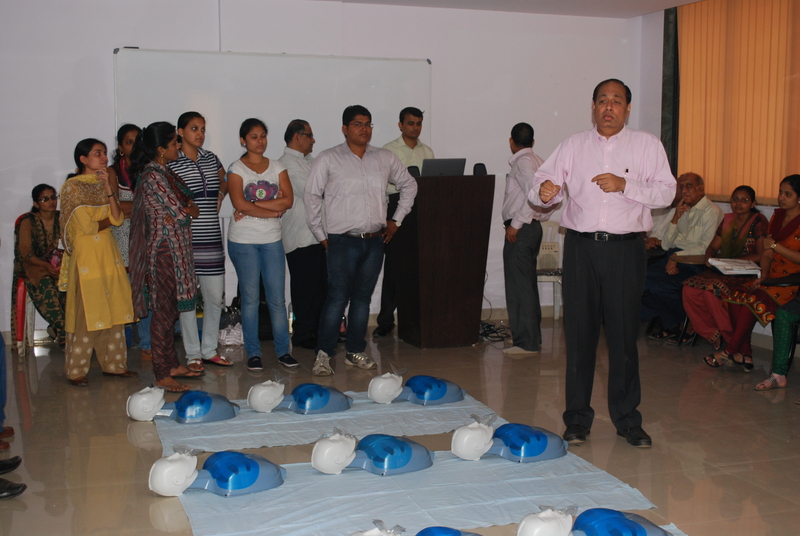 “First aid and CPR are aspects everybody should know and so the session was very beneficial. Now I’ll have more confidence in not only attending to emergencies but also day to day health management of my near and dear ones. It was a very fulfilling and informative workshop. A big thanks and bingo to VV and LIHS! !” – Dr. Divya Bijur, practicing Physiotherapist. “It was very useful. It helped to clear a lot of wrong things we were following. If we are not able to do some of it, knowing it, we can guide others if around us to do the same in emergencies.” – Shiv kumar Raheja, medical transcriptionist. “This Session was very useful and beneficial. The information provided is very important in our dayto-day life. And also the way in which this information was imparted was easy to understand and easy to learn. i would share this knowledge that i gained today among my friends (among both Visually Impaired and sighted friends). I will also teach my family members how to give first aid and what is its importance. I really liked this session.” – Prathamesh Bendre, student. Previous PostPrevious Self Defense: Be Alert & Be Aware!